This was a fast and fun quilt to put together, I made the top in February in very little time (see my original post) but it spent months sitting in the “must finish” pile. 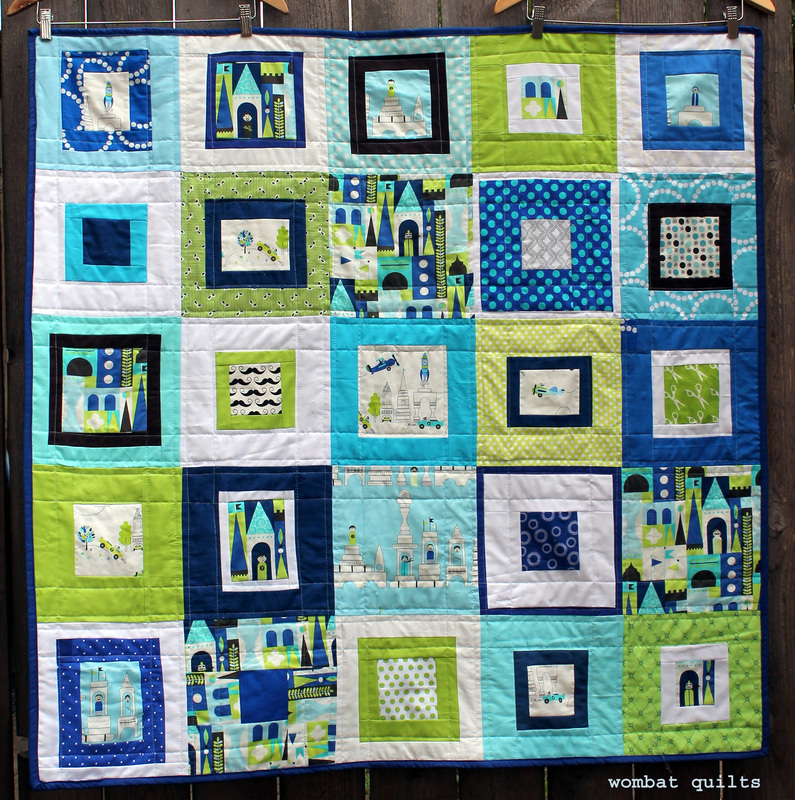 For this quilt, I started with a handful of the prints from Michael Miller’s fabulous Les Monsieur line and some coordinating fabrics from my stash. I then spent a few hours making log cabin blocks, all 9 1/2 inches square but with random sized logs/sashing. 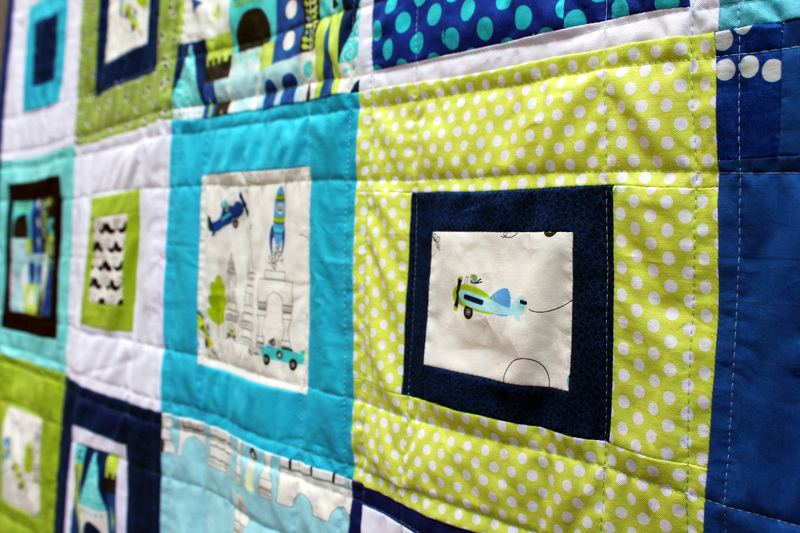 What I love about this type of quilt top is that it is a great way to highlight a fun novelty print line…and I always start by cutting out blocks of just the prints (giving you instantly 3 – 4 blocks to start). Then I fussy cut some of the novelty prints for the center of the blocks and go to work. It is just fun putting everything together, of course making sure that there is some lights (in this case white) and darks (navy blue and a touch of brown). If there are any of the focus prints left over I tend to incorporate them into the back of the quilt. 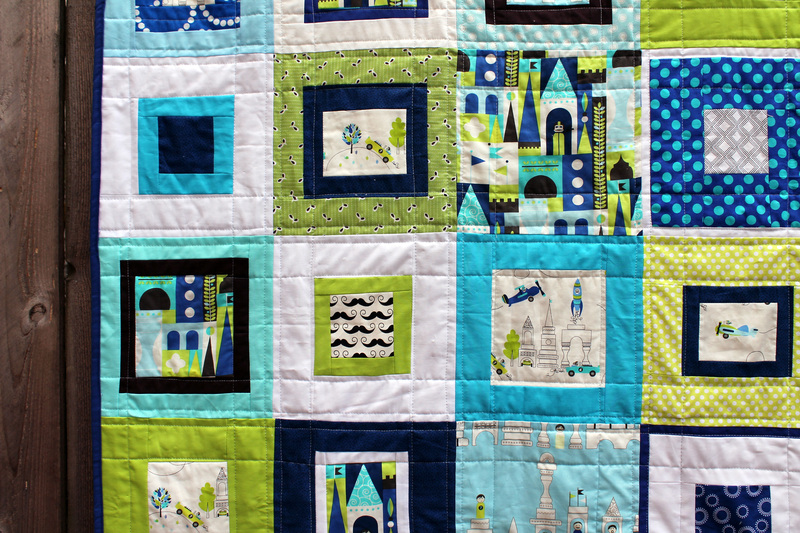 This quilt was delivered yesterday to Project Linus and is one of my entries into this years 100 Quilts for Kids drive. For the last couple of years I have been a part of the 100 Quilts for Kids drive that Katie Blakesley of SwimBikeQuilt set up. The idea is simple, for the months of August and September you are encouraged to make a quilt and donate it to a child/teen in your own community. This year the quilt drive is being hosted by Quilts in the Queue and there are some beautiful quilts that have already been donated …. oh did I mention you can also win some lovely prizes by donating a quilt and then linking a photo to the 100 Quilts for Kids site? Thanks. I must admit I really like it to. The fabric really makes for a fun quilt. I’m with you on this; using big chunks of feature fabric is a great way to showcase prints you love AND gets the quilt off to a great start. That’s a great boy quilt too, so often donated quilts are great for girls, but a bit too ‘pretty’ for a boy. It is a constant struggle to get quilts for boys at Project Linus. There is usually on boy quilt for every ten or so girls quilts. I find boy quilts hard because I’m so often drawn to florals! One day, a long time from now, I’ll make a quilt which is all graphic prints in non-girly colour. And then I’ll stop and go back to my favourite thing! I hear you. Pink is my go to color and strangely boys tend to not like it! Go figure. I am a fan of using great novelty prints as star centers too. 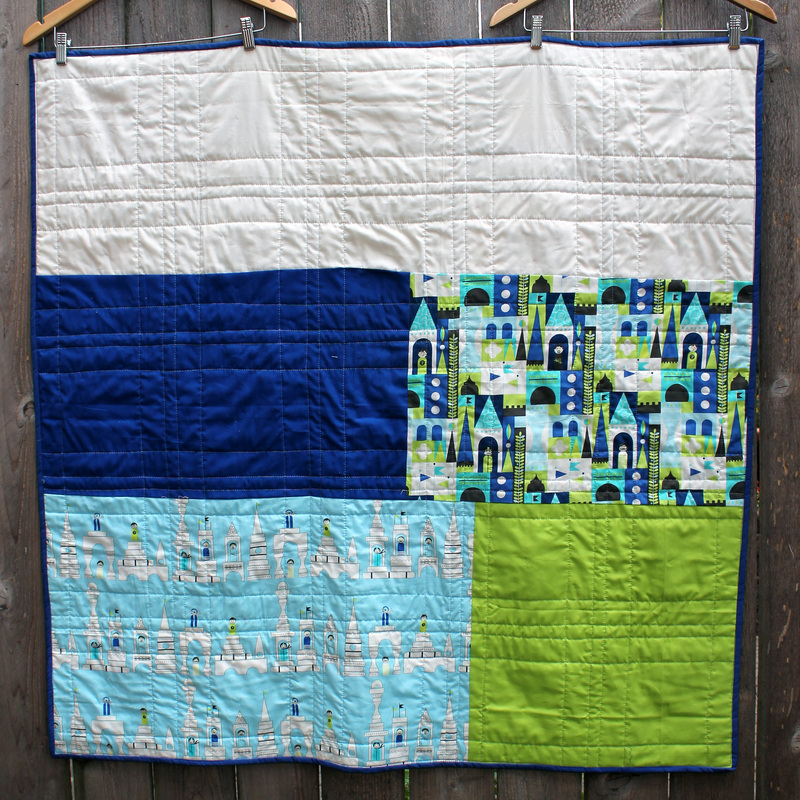 I think the quilt really features the fabric and is so easy to do….no real right or wrong! 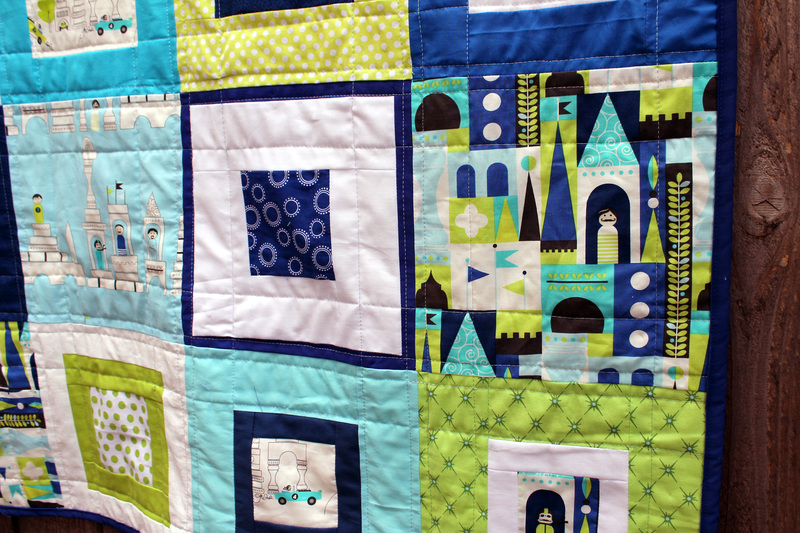 What a fun quilt for a kiddo! I love the bright colors and fun prints you chose! Gorgeous! How did I miss this line? So adorable. I stumbled across this fabric series on line and fell in love. It is hard to find great fabrics for boys so I grab it when I see it. You’re so right! My last favorite for boys was a few prints in one of the color ways of castle peeps by Lizzie House. How long ago was that? Fortunately the boys I make quilts for are too young to care, by the time they do, they hopefully love their quilts anyway. But I wanted to consider new, larger ones as each turned five. I have a nice stash of Castle peeps and 1001 Peeps. They are great boys lines. I wish I’d had the foresight to purchase more of it. But something else will come along in the next three years, when the first one reaches five. Thanks Lesley… The randomness is one of my favorite aspects too. Great looking quilt. Love the fabrics and colors.